For other people named William Redfield, see William Redfield (disambiguation). 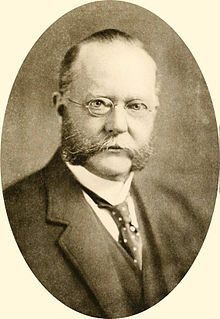 William Cox Redfield (June 18, 1858 – June 13, 1932) was a Democratic politician from New York. He served as the first United States Secretary of Commerce from 1913 to 1919 after the division of the Department of Commerce and Labor. Previously, Redfield served as a U.S. Representative from New York from 1911 to 1913 and was an unsuccessful Democratic nominee for the vice presidency in 1912. Redfield, William Cox (1912). The new industrial day, a book for men who employ men. New York: The Century Co. LCCN 12025163. Redfield, William (April 1912). "The Progress of Japanese Industry". The Journal of Race Development. 2 (4): 362–372. doi:10.2307/29737925. Redfield, William Cox (1924). With Congress and cabinet. Garden City, N.Y.: Doubleday, Page & company. LCCN 24006006. Redfield, William Cox (1927). We and the world. New York: Newark [etc.] LCCN 27024211. United States Congress. "William C. Redfield (id: R000105)". Biographical Directory of the United States Congress. Wikimedia Commons has media related to William C. Redfield.